Abortion advocates have shown us their hand. They are even more heartless than we imagined. 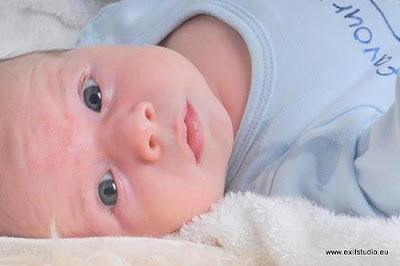 Their commitment to end the lives of babies was made clear when New York legalized abortions right up to birth, Vermont and Rhode Island also passed radical abortion and infanticide laws, and other states are attempting to do the same. As of this writing, Democrats have blocked the Born-Alive Survivors Protection Act for the 30th time. How hard is it to say living babies have a right to care? Too hard for Democrat lawmakers. Planned Parenthood owns them, and Planned Parenthood is not compatible with life. In last year’s election, they spent over $5 million spent on 40 candidates. This barbarism has fired up consciences across the U.S. as pro-life bills are introduced and passed—250 of them in 41 states so far in 2019. This week, Ohio passed the six-week the "heartbeat bill" making abortion after a heartbeat is detected a fifth-degree felony, and North Dakota became the third state that has outlawed dismemberment abortions. Protecting beating hearts and outlawing babies’ dismemberment, reveals that the grisly business of abortion involves are more than just a cluster of cells. Pro-abortion lawmakers in North Dakota complained the bill’s terminology was too explicit and would turn state law into a "graphic novel." Seriously? What do they think abortion is? Also, in North Dakota last month, the governor signed a bill requiring physicians to inform women that it may be possible to reverse a drug-induced abortion, which opponents said wasn't backed by medical evidence. A lawmaker who supported the legislation called it a "women's right-to-know bill." Guess who was against it? bortion industry is intensifying. They are pushing ever harder for death as we push and pray ever harder for life. 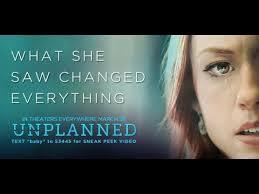 One of the answers to our prayers is the just released movie Unplanned. It masterfully tells the truth in a way that does not demonize the ignorant while still revealing the horrors of abortion. Success at the box office was beyond expectations despite all the sabotage. 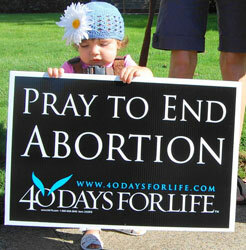 And since the movie came out, participants have increased at the 40 Days for Lifeprayer campaigns outside of abortion facilities. While the pro-abortion side lies, tells people to publicly celebrate their abortions, and disables Twitter accounts, we continue to witness to the truth, support pregnant women with real help, and pray, fast and sacrifice against abortion. Let us pray also that more people in the industry will see the light like Abby Johnson did and become powerful advocates for life.